People from all over the world have savored the tantalizing, tangy and spicy aromas and flavors of Indian cuisine. It is believed that India’s culinary legacy spans centuries, and that the science of ingredients was developed in close rapport with holistic medicine. India’s fragrance tradition goes back to the Vedas (nearly 8,000 years). 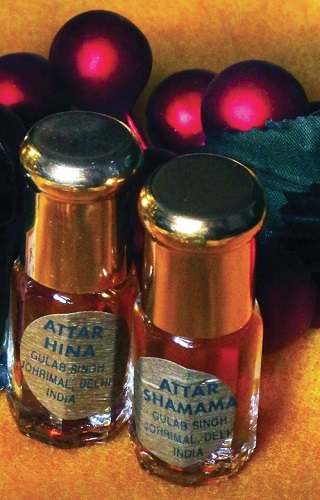 “Attar,” or non-alcoholic oil concentrates, are leitmotif of Indian fragrance. Being an ancient treasure house of exotic indigenous woods, herbs, spices and flowers—to name a few—there are eight ingredients from among these that unite both worlds of India’s flavors and fragrances. 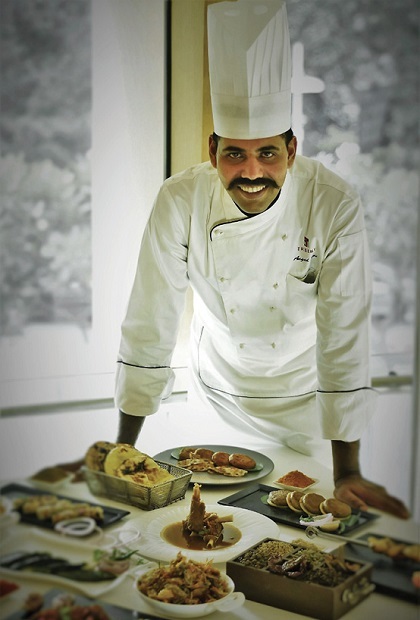 Chef Angad Rai, Trident Bandra-Kurla-Mumbai. Photo courtesy of the author. Chef Angad Rai, master Indian Specialty chef at Mumbai’s Trident Bandra-Kurla five star hotel, and Krishan Mohan, one of India’s senior-most living traditional perfumers, unveil their symphony of ingredients through their magical works. As the historic “home of spices,” India’s sheer variety of ingredients and health-benefits are legendary. Clove, one of the most potent of all spices, is the dominant ingredient in the smoky Gosht Kandahari (lamb smoked with cloves)—one of the finest meat dishes at Maya, the Trident Bandra-Kurla’s signature Indian restaurant. While black cardamom is generally used in garam masalas (a mélange of powdered spices used to flavor curries and other dishes), green cardamom has its equal role in flavoring. Maya’s wholesome and comforting taftan (leavened flour bread) has its fair share of cardamom forming a smooth, tangy carpet on the palate. Cinnamon, the “prince of flavors,” is again a principle ingredient of Maya’s garam masala for biryani, an exotic south Asian rice preparation. 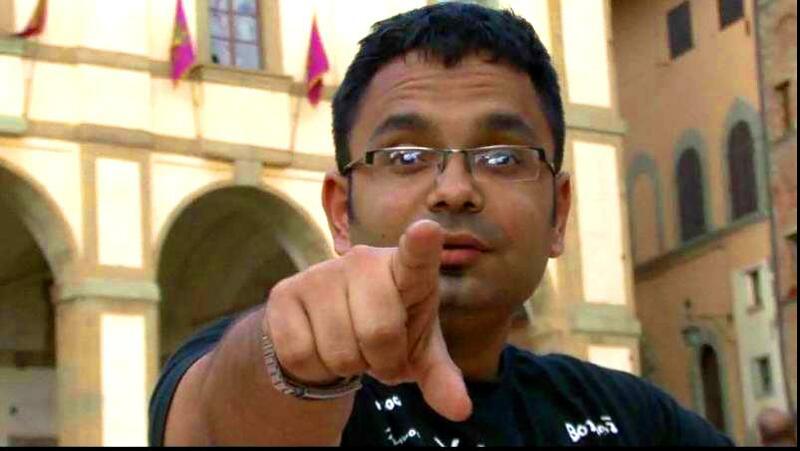 Perfumer Krishan Mohan, on the other hand, boasts of three ancient attars: hina, shamama and mushk-e-ambar. These brother fragrances—favorites of the Nawaabs (Muslim royalty)—are known to be historic winter scents for their incredibly warming effect. Each of these is a marriage of over 100 exotic spices including cardamom, cinnamon and clove over a rich sandalwood base. Pandanus odoratissimus is a flower that grows only in India along its southeastern coast. The fragrance is exhilarating and light. Kewra oil and water-flavored dishes include biryanis, kebabs and kormas (braised meat). Kewra oil is also used in piste ki Lauj, a mouth-melting pistachio dessert of northern India’s business community. In Maya’s Gosht Galauti kebab dish (pan friend lamb galettes), kewra provides eclectic refinement, leaving its gentle touch on the palate. Attar kewra is derived by distilling kewra petals over sandalwood oil in large copper chambers called “deg.” While sandalwood provides a firm framework, the light and soft attar is a summer scent that has a cooling effect, providing relief from the scorching Indian heat. The king of flowers finds its place in Indian cuisine and fragrances equally. Dried and crushed rose petals are used to marinate meat—such as Lucknowi kormas—as well as to soak with saffron and add flavor to “Sharbat,” a traditional flavored non-alcoholic drink. Indian roses are small and exhibit an intense scent with a double row of petals. The famous Malai Varqi paratha (flaky bread enriched with ghee, milk and rose petal powder) is reminiscent of the royals. While rose water (gulab jal) has ritualistic and culinary significance, the exorbitant Ruh Gulab (pure rose extract) and Attar gulab (distilled rose over sandalwood oil) are evergreen Indian perfumes. Krishan Mohan’s sought-after blends with dominant rose notes paired with amber, oud and musk include Manzar, Sultan and Oud Rose, along with ethereal synthetic rose oils. A fantastic after-meal digestive, aniseed is consumed in a variety of ways. Essential to both north and south Indian cooking, powdered anise is preferred to frying. While Rampuri Gosht korma (lamb with vegetable gum cooked in yogurt curry, flavored with aniseed) amply glorifies aniseed and aniseed oil, along with its therapeutic effects forms an integral part of violet, a rich floral blend with a vanilla base and violet flower. As royal as it can get, saffron is an essential ingredient in Arabic, Turkish, Persian and Indian cuisines. Saffron strands are soaked in a bit of warm water or milk to infuse the liquid for a month. Mughal cuisine, with its kormas and biryanis, generously uses saffron. Apart from the deeply nourishing saffron tea “kesar chai,” Angad’s taftan bread uses saffron as a key component giving it the richness along with Kesar Badam kheer (rice, almonds and saffron cooked in clarified butter and milk), his all-time classic dessert. Krishan Mohan’s signature saffron masterpieces include Arabesque blends. Fitrat, a classy sandalwood, musk, oud, rose and saffron woody floral. Shabab, Sharara and Zubeida with top notes of saffron and sandalwood, palmarosa, musk, amber, vetiver and bergamot among other notes. Known as “khus,” vetiver’s deeply cooling effect has made it synonymous with cooling drinks as a syrup and food flavoring food. Vetiver is the key ingredient in a special tangy and wholesome kebab masala called Lazzat-e-taam in Lucknow. “Ruh khus,” or pure vetiver extract, has been a historic summer scent and is also added in blends to make subtle magic. It is also added in tiny doses inside “paan” (digestive beetle leaf preparation) to cut the spice. India’s ingredients tell a rich story of the close-knit relationship between the senses, where health is a foundation of each dish or perfume. When experiencing Angad Rai and Krishan Mohan’s creations, one is certainly taking a trip through history!